Marvine Gay McCallister Johnson Loving of Cross Lanes, WV, earned her angel wings February 7, 2019, surrounded by her family. Marvine was 93, born September 4, 1925, the youngest child of William B. and Nellie Madora McCallister. She had 5 siblings. She was preceded by her parents, her first husband, Raymon Edward Johnson and her youngest son, Timothy Joe Johnson, siblings, James Leo, Denver Guy, Delcie Pearl, Ona Oeida and Oma Waneda. Marvine is survived by her husband of fifty years, William Orval “John” Loving. She is also survived by children, Judith Batterson, Dannie Michael Johnson (Margaret), Mark Edward Johnson (Kathy), and step children, Patti Alexander (Aaron) and Valerie Melton (Scott). She leaves behind ten grandchildren, Angel Tygrett (Eric), Heather Hill (Mike), Jeremy Johnson, Heath Johnson, Monica Higginbotham, Jason Lawrence, Bowman Alexander, Sophie Alexander, Nikki Roach (Mathew), Jesse Melton and Jennifer Freeman; eight great-grandchildren, Steven Tygrett, Erica Tygrett, Hallie Fogarty, Lacie Fogarty, Addison Higginbotham, Genny Roach, Malcolm Roach, Lainey Melton-Caudill and one great-great-granddaughter, Avery Tygrett. 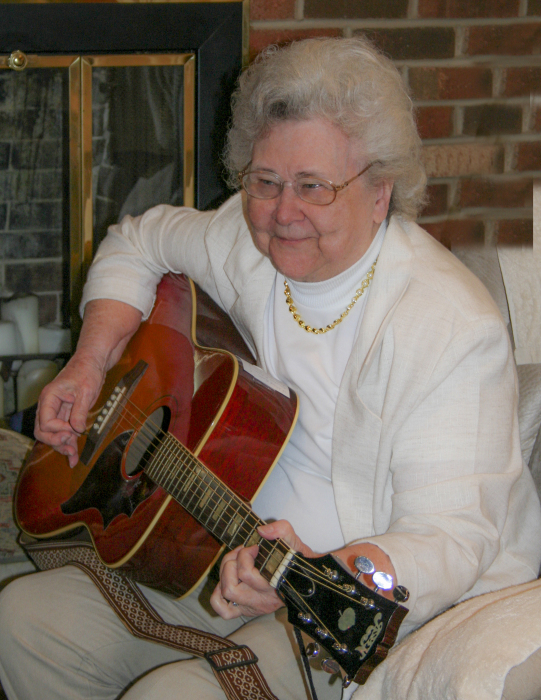 Marvine was the first President of the Bill Monroe Fan Club and a gifted musician in her own right. She played rhythm guitar and autoharp and had a beautiful singing voice. Marvine & John together played music all around the state of WV and the tri-state area, and professionally performed WV heritage style music for 25 consecutive Vandalia Gatherings at the WV State Capitol. She loved to watch golf on TV; she always cheered for the Cincinnati Reds and the Atlanta Braves. She was an avid crafter with hand pieced quilts, crochet and needlework. Marvine raised her four children, two step-daughters and two of her grandchildren with immense love and a gentle hand and showed us how to be strong through the most difficult times. She taught us to be the best people we could possibly be and to be genuine and true to ourselves and she expected that from all who was around her. She loved children of all ages, her family and music. Everyone who ever met Marvine loved her in return. Her kind heart and warm spirit welcomed and comforted all those who had the good fortune to know her. She loved hugs and gave the best ones back. Funeral service will be Monday, February 11, 2019, at 11 a.m. at Allen Funeral Home. Burial will follow at Mt. Moriah Cemetery. Friends and family may call Sunday, February 10 ,2019, 6-8 p.m. at Allen Funeral Home and one hour prior to service on Monday.